The psychology of conspiracy theories is an ever-growing field. I have Google Scholar Alerts set up to let me know of new research and the alerts have been particularly active recently. It is great to see the field flourishing with activity. We are learning more about who endorses conspiracy theories, and why, whilst also examining their societal consequences. Some of the recent research has been published by colleagues of this blog – such as Rob’s paper on people who are prone to boredom being more likely to believe in conspiracy theories and Mike’s paper showing that labelling an idea a “conspiracy theory” does not make people less likely to believe it. Another paper recently has also sparked my attention. 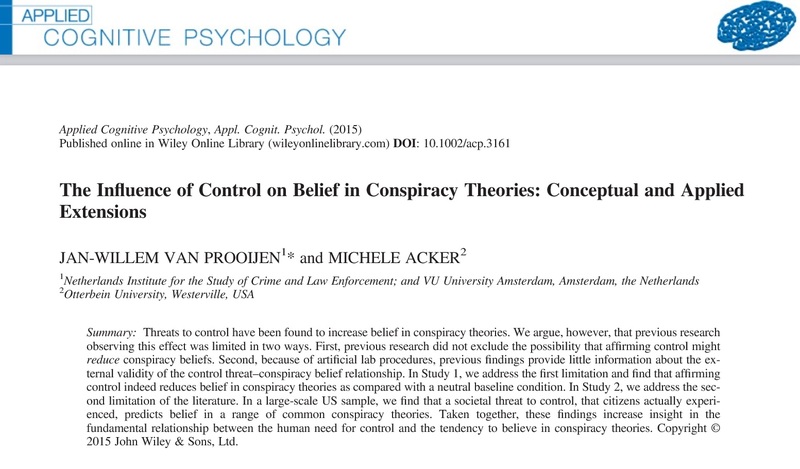 The paper has been published by van Prooijen and Acker in Applied Cognitive Psychology that further examined the question of why people endorse conspiracy theories. Simply across two studies, they found that if people feel they do not have control over a situation (both in an experimental and a real-life control scenario), they indicated belief in conspiracy theories to a greater extent. My own line of research is investigating the social psychological consequences of conspiracy theories (example post here) and how we can address these consequences. I therefore found their research particularly relevant. Specifically in Study 1, participants were exposed to three conditions: primed with either high or low control, or a baseline condition that was unrelated to control. The prime involved the participants writing down times when they felt in control (high) vs. times when they did not feel in control (low). In the baseline, participant recalled what they had for dinner last night. As already mentioned, they found that low control is associated with higher belief in conspiracy theories. 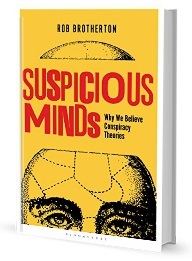 They also found however, that those in the high control condition reported reduced belief in conspiracy theories when compared to those in the baseline condition. Affirming a sense of control can buffer people against conspiracy theories. Their study therefore offers a potential avenue to intervention. The implication of the research, as highlighted in the paper, is clear: When society is facing a control threat, it is important for political leaders to instil a sense of trust. van Prooijen and Acker suggest one way to do this is for leaders to be transparent about motivations for important decisions, as this has been associated with feelings of control. Research examining tools to address the potential consequences of conspiracy theories is important. Exploring these tools is only in its infancy however, but the findings from this paper are promising. Watch this space. This entry was posted in Reviews, What's the harm and tagged beliefs, conspiracy theories. Bookmark the permalink. All well and good Jolley, but why is it that you so-called “psychologists” never discuss the actual conspiracies, and the critical thinking involved in exposing such conspiracies? This argument that “belief” in “conspiracy theories” can be simply handwaved with ‘psychological theories’ is lame and tepid argumentation at best, and vile and dangerous propaganda at worst. As of September 2015 we find that this prediction by Jolley was totally fallacious, and that the conspiracy of psychological theories is as baseless as this bogus prediction. Interesting. Given all of Greece’s current economic woes, I should imagine there’s been a corresponding decrease in the perception of control over their own lives in the Greek populace. I wonder if anyone has looked at general belief in various conspiracy theories and whether that level has changed since the global financial crisis hit. The Greek government’s decision to hold a referendum on the EU bail out might well have restored or maintained a feeling of control. Of course these feelings of having some control were illusory, as The Greeks still suffer under the same untenable austerity measures that were being imposed before the referendum.